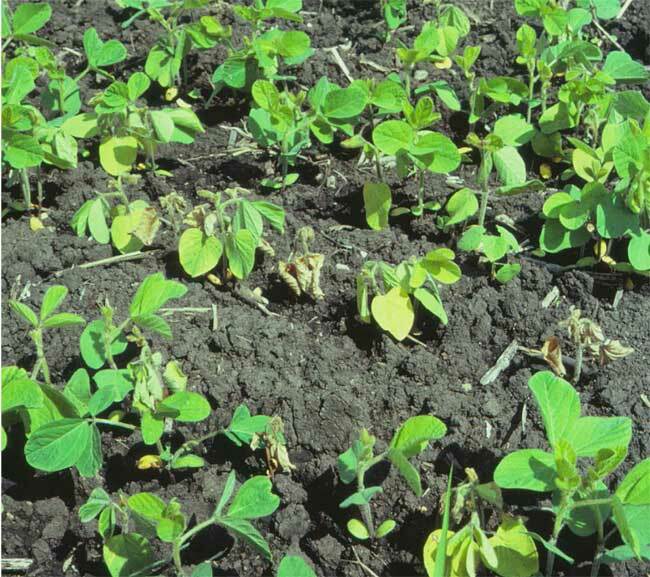 Soybean Seedling Diseases discusses the characteristics of the organisms that cause seedling diseases, describes injury symptoms that may appear similar to these diseases, and addresses how to manage seedling diseases. Seedling health can be compromised by plant pathogenic fungi that cause seed rot, seedling death, and root decay. 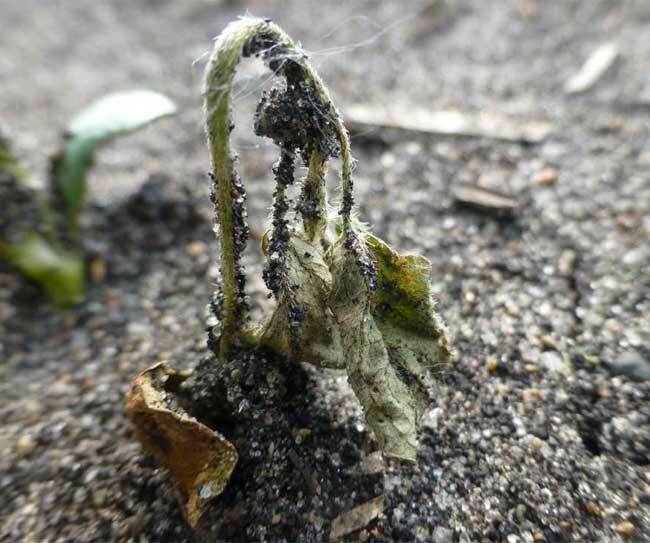 Seedling-infecting fungi are common in soybean fields. Poor stands may be the first indication of a pathogen problem. Damping-off, or seedling blight, is a general name for infections that occur underground or at the soil surface, toppling the seedlings at the base. Diseased seedlings are often weak and less vigorous, and severe stand loss may require replanting. Seedling diseases are often more prevalent when wet weather follows planting. They are generally more common in compacted and poorly drained soils or in areas where seedlings have been injured. Phytophthora sojae, several species of Pythium fungi, and Rhizoctonia solani are the most important seedling pathogens in the north-central states. 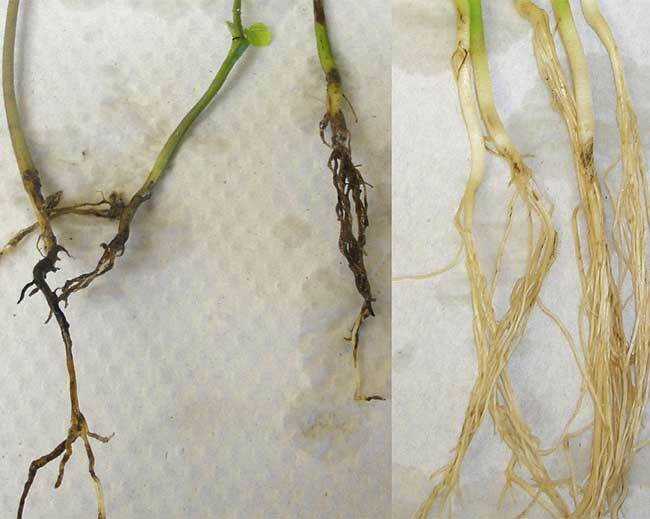 Plant pathologists at Iowa State University have found that Pythium, Phytophthora, and Rhizoctonia account for nearly 90% of disease-related stand reduction problems in Iowa. Other plant pathogens actively invade plants from growth stages VE to V4 as well, including Fusarium spp., Mycoleptodiscus terrestris, Macrophomina phaseolina (charcoal rot), Fusarium verguliforme (sudden death syndrome), and Phialophora gregata (brown stem rot). Seedling infection by these pathogens may cause chronic symptoms, or the infection can remain latent and cause premature decline of foliage and stems later in the growing season. Seedborne pathogens can also affect germination. Seed infected with Phomopsis longicola, Cercospora spp. or Fusarium spp. may rot during the germination or emergence phase. Frequently, seedling health is ignored because plant populations are acceptable and stem and leaves do not express symptoms during early vegetative growth. However, notes taken about plant health in the seedling phase can be used to make adjustments in crop management in subsequent years, and may help diagnose symptoms or explain less-than-anticipated yield later in the season. Several fungi can cause stand establishment problems either before or after emergence. When digging in the seed bed, look for rotted or mushy seed. As seedlings emerge, scout for decay on roots and stems. Plant death can be rapid. Often, there can be an uneven distribution of mortality in the field, or the poor stands may be limited to especially wet areas of the field. Seedling diseases are difficult to correctly diagnose in the field, and it is easy to mistake them for other problems such as herbicide damage. In addition, seedlings may be affected by more than one seedling disease. For these reasons, we recommend sending injured or diseased soybean seedlings to a local diagnostic lab (along with all relevant field information) to confirm the cause before implementing a disease management program. Obtaining an accurate diagnosis will allow you to determine the best management strategies for your soybean field. Poor emergence, and rotted, mushy seed is favored by wet soils. 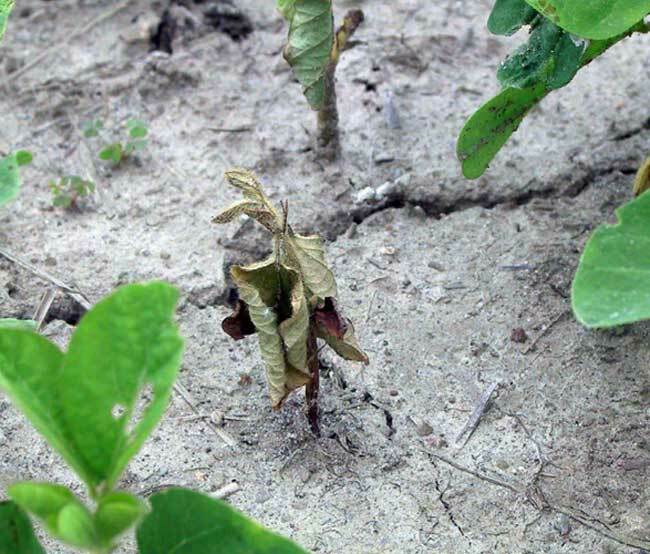 Phytophthora sojae can infect soybean seeds before emergence, causing them to rot. Infection by Pythium spp. also causes a soft, wet rot of seed or seedling tissue similar to that of Phytopthora. Seed-borne fungi such as Phomopsis can also rot seed at germination. Damping off is the collective term for infection below or at the soil surface. Plants infected at the seedling stage will show the typical "damping-off" disease symptoms of bruised, soft stems and rotted roots. Plants frequently wilt and die. Also called seedling blight. 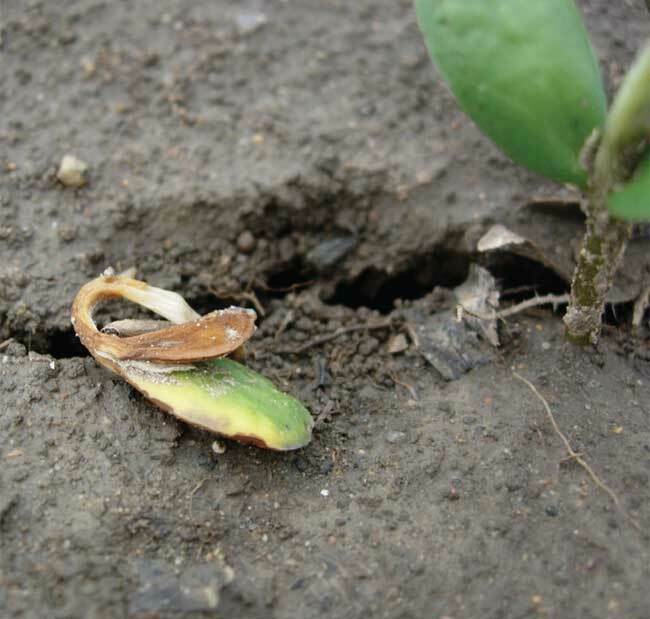 Stem decay may occur at the seedling stage, or may not be apparant until later in the reproductive stages. In seedlings and older plants, a reddish-brown sunken lesion is a characteristic symptom of Rhizoctonia infection. Unlike infection caused by Phytophthora, or Pythium, the infected stems remain firm and dry. See Table 1. in Soybean Seedling Diseases (CPN1008) for a comparison of symptoms and distribution of common soybean seedling blights, herbicide damage, and other seedling disorders. Pre- and post-emergence diseases of soybean are common in all soybean-growing areas of the United States. 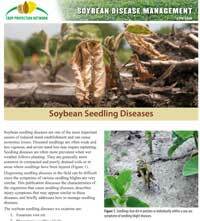 Seed and seedling diseases reduce stands in the spring, with severity varying from year to year. However, a stand reduction does not always mean a lower yield since the soybean plant is able to compensate for space. Disease development and yield loss can be significant when seedling infection occurs by major soybean pathogens such as Fusarium virguliforme, the causal agent of sudden death syndrome, or Phialophora gregata, the brown stem rot pathogen. These pathogens can infect seedlings in the vegetative phases but cause no symptoms until later in the growing season when the plant reaches reproductive growth stages. Seed and seedling-infecting fungi are common to soybean fields. The fungi are usually associated with soil debris and can survive for long periods in the soil. Root and seed exudates stimulate the germination of the fungal spores, which grow and infect the seed or seedling when conditions are favorable. Conditions that favor fungal growth and infection are generally those that slow the germination and growth of the soybean seedling. 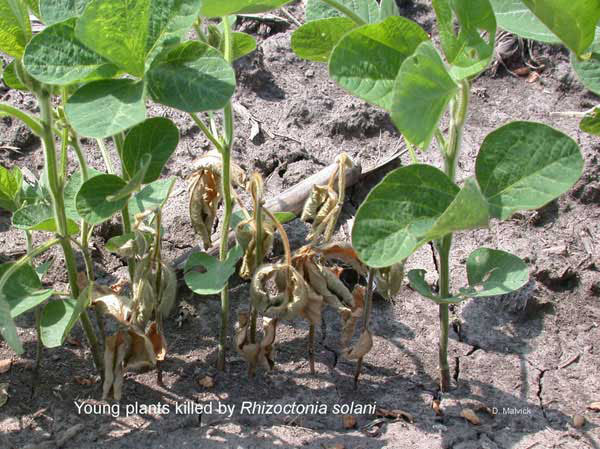 If dead plants are scattered throughout the field, and no significant stand reduction is apparant, or replanting is not needed, then no action is needed if the disease is Pythium or Rhizoctonia damping-off. If the disease is Phytophthora damping-off and it occurs on a Phytophthora-resistant variety, then your resistance has been defeated by the fungus. 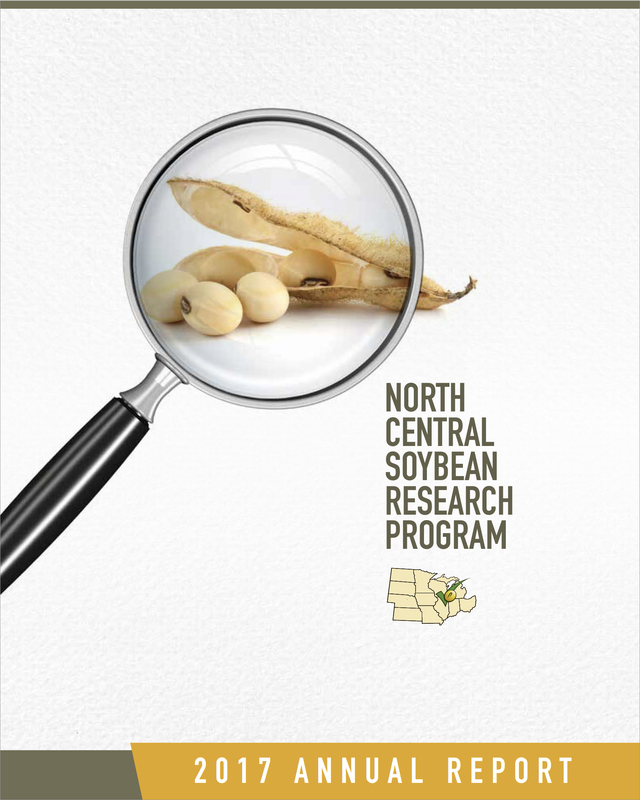 Consider using a variety with a better resistance gene for the next soybean crop. Although replanting is not always needed with stand reduction, be aware that root rot, especially Rhizoctonia root rot, and stem decay may appear later in plants that are infected but not killed as seedlings. Take good disease notes and use preventive measures such as seed treatment or resistant varieties to reduce the likelihood of a disease problem in the next soybean crop. If poor stands are due to diseases, seed treatments with fungicides can be used in replanting to avoid further damping-off, especially for Rhizoctonia and Phytophthora. If poor stands are due to a low germination rate, a seed treatment cannot improve seed vigor or seed germination rate. Consider if a better seed bed could be prepared. Consider if soil drainage could be improved, or if low areas of fields could be avoided. Plant seed that has resistance to Phytophthora. Specific resistance is controlled by major resistance genes such as Rps1a, Rps1c or Rps1k (Rps stands for Resistance to Phytophthora sojae). In addition to Rps resistance, select varieties with high field resistance (also called partial resistance or qualitative resistance) when possible. Plant where drainage is adequate, or improve drainage if possible. Avoid low areas of fields, especially if a field has a history of seedling or root rot problems. Damage by Rhizoctonia and Phytophthora beyond the seedling stages can be reduced by mid-season cultivation. Cultivation mounds the soil around the base of soybean plants, which promotes new growth of roots. Use field history as the key component of the decision-making process for managing seedling disease. Research over the years in all north-central states have shown no consistent significant yield improvement by treating seeds with fungicides unless there is a significant risk of seedling disease. Neither early planting nor the use of no-till alone indicates a decision to use seed treatment. Seed treatments may be worth considering in fields that have a history of seed rot, damping off, or premature stem and root decay, or in fields that are prone to slow germination due to poor drainage or other factors. 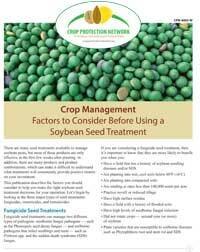 See Factors to consider before using a soybean seed treatment. Crop Protection Network: CPN 4003, 2018. Which seed treatment product to use?